Disclosure: We received a sample product in order to facilitate this review. All opinions are 100 percent my own. I would never have imagined how much of a hard time I would have with homeschooling PreK for my 3 year old. I have seriously had such a hard time figuring out what I should teach him, and trying to find fun and educational things for him to do. I have a hard time finding a balance between fun and learning, and sometimes I feel like I am doing all "play" or all "educational" stuff, with no in between. So, whenever I get the chance to check out a product that might help me combine the two, I jump at the chance. This time around, we got to review the Learn With Me Color Fun Fish Bowl from The Learning Journey. The Learning Journey is one of my favorite companies, and we buy a ton of stuff from there every year. I like that they make great products that combine both fun and learning! First of all, this toy is adorable! Just look at it! 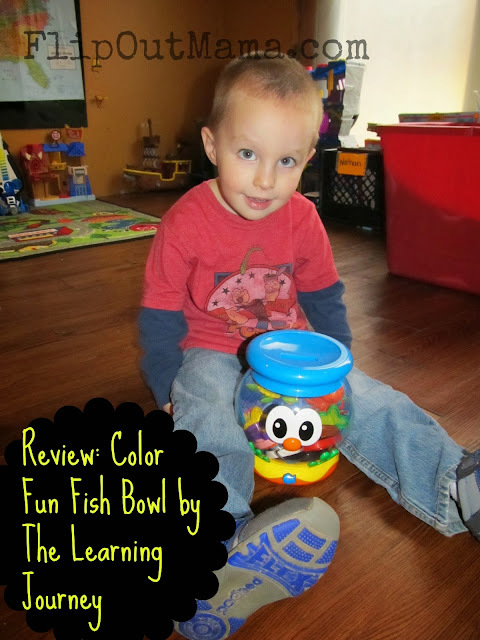 I love the bright colors and the adorable fish bowl with it's big eyes and smiley face! So cute! This toy has been a lot of fun for my little guy, but it has also been a source of frustration. The fish need to be inserted in one direction only, so getting that through my three year old's head has been a real pain, he just doesn't get it! Thankfully, big brother was able to show him the right way pretty quickly! 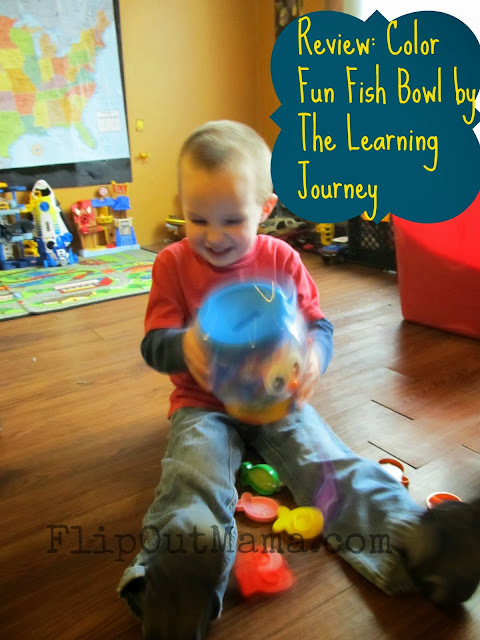 There are two different ways to play with the Color Fun Fish Bowl. 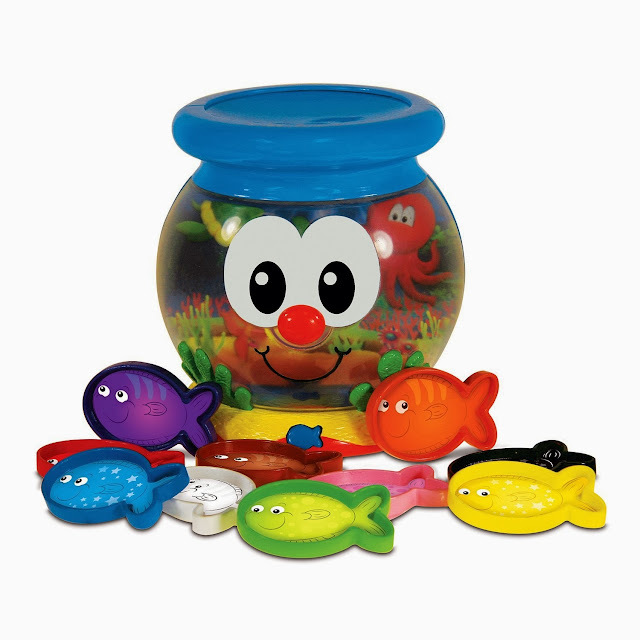 The first way is the mode where the fish bowl asks for a certain color fish, and then you put the right one in. The second mode is where you put a fish in the fish bowl and the fish bowl tells you what color it was. I really like the fact that this toy has two different play modes, it keeps it from getting boring! I am not really sure if something is wrong with the Color Fun Fish Bowl that we received, like a possible glitch of some sort, but probably about 20 percent of the time, it says the wrong color. Now for us, we have just used this as a learning opportunity. Since my guy already knows his colors, he just says "No funny fish bowl, that is a RED fish!" when the fish bowl gets it wrong. So, for us, this is just another way to reiterate what we have already learned, but I can see how if you have younger kids who don't know their colors yet, this could be very confusing! However, for us,this has been a very fun toy and my little guy is enjoying it a lot! I love toys like this and hope to be able to add more to our collection in the near future! 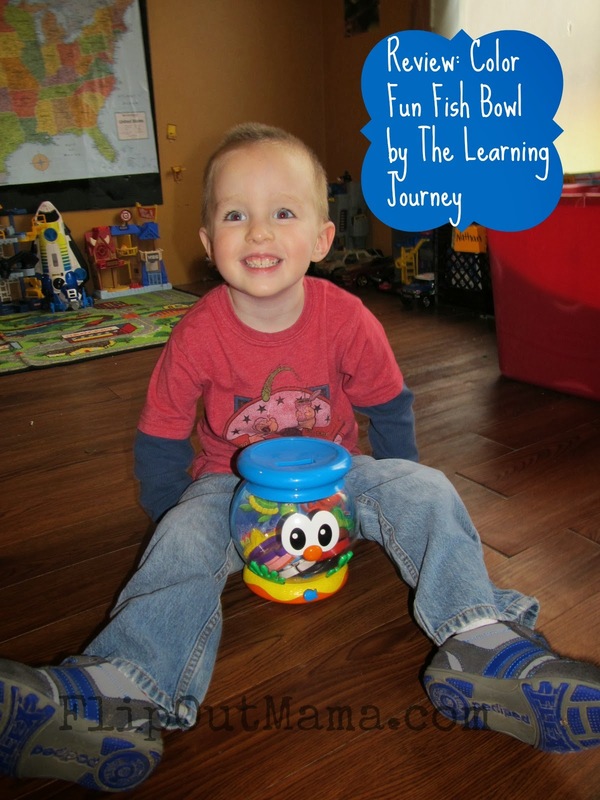 If you would like to check out all of the cool toys that The Learning Journey International carries, you can CLICK HERE! Also make sure to follow them on Facebook and Twitter to stay up to date with all of their fun and educational happenings!